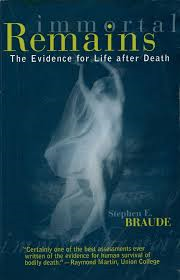 Stephen E. Braude is a philosopher who became well-known in parapsychology for his critical writings during the late 1970s and 1980s. Over the years I have seen Steve in various conventions. My contact with him in recent times is related to his editorship of the Journal of Scientific Exploration, for which I serve as an Associate Editor. 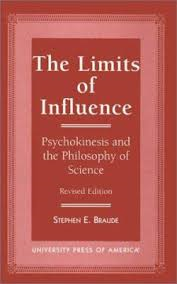 Some of Steve’s best known works are his books ESP and Psychokinesis: A Philosophical Examination (1979, 2nd ed., 2002), and The Limits of Influence: Psychokinesis and the Philosophy of Science (1986, 2nd ed., 1991). As I’ve documented in detail in several of my publications, including my book Immortal Remains and my essay “The Fear of Psi”, what corrupted me was a table-tilting session in my home while I was in graduate school. It impressed me profoundly, but I was both sensible and cowardly enough to conceal this fact from my mentors, finish my PhD, get a job, establish a decent reputation doing mainstream work in philosophical logic and the philosophy of time, and finally get tenure. At that point I realized that if I was an honest intellect I needed to confront my table-tilting experience, and learn as much as I could about parapsychology and what other philosophers have had to say about it. So it wouldn’t be quite right to trace my interest back to those days in grad school, because I really put the whole subject out of mind until years later, when–liberated by tenure–I had the freedom to reflect on that earlier experience and immerse myself in the literature. That’s evolved somewhat, as my study of the data progressed. First, I dealt with just the laboratory evidence (since I was still in the grip of the illusion that it was the strongest and most persuasive evidence available) and produced my book ESP and Psychokinesis. By the time that was done, I’d already starting absorbing the evidence from physical and mental mediumship and realized how much better it was than even many parapsychologists realized. So I dealt initially with macro-PK and physical mediumship in my next book, The Limits of Influence. From there I moved on to mental mediumship and started to consider what I wanted to say about the topic of survival. But I knew also that people suffering from multiple personality disorder (now called dissociative identity disorder) behaved in ways that in many respects resembled the behavior of mental mediums. So I realized I couldn’t do a responsible job of confronting the evidence for survival without knowing more about the relevant areas of abnormal psychology and psychopathology. So I took a philosophically rewarding detour, studied the history of hypnosis and psychiatry, and became very familiar with MPD research and those conducting the research. This detour also allowed me to grapple further with some important issues in the philosophy of mind which I’d begun addressing in my first book (in particular, the failures of mechanistic analyses of the mental). Eventually, all this work led to my writing my book on multiplicity and dissociation, First Person Plural. By that time, I was sufficiently chronologically challenged for a book on survival to be more than appropriate, and I eventually wrote Immortal Remains. Then I decided to write a kind of memoir, describing my most interesting–but not necessarily my most successful–PK investigations. That resulted in my book The Gold Leaf Lady. And most recently I produced a collection of essays, with revised and updated versions of several papers I’ve considered to be among my best, and supplemented with a couple of new essays written specifically for that volume: Crimes of Reason. Now, as a semi-retired person, I find I still chase macro-PK cases when I can drum up the financial support. You’re probably expecting me to say something like: “It will provide distinctive insights into the nature of mind or reality in general.” And no doubt that’s true. But I disagree with those who think that the study of ESP and PK distinctively reveal flaws in conventional physicalist or mechanistic analyses of the mental. As far as that topic is concerned, I’d say that psi phenomena are no more illuminating than most ordinary mental phenomena, like memory and volition. A clear-headed analysis of those phenomena does, I believe, show why mechanistic explanations of mental phenomena are unsatisfactory. However, conclusive evidence for postmortem survival would finally put an end to physicalist pretensions. It wouldn’t by itself sabotage mechanistic analyses of the mental, because problems with mechanistic theories are hardware-independent (for more on that, I heartily and self-servingly recommend Crimes of Reason). Physics envy, an obsession with bringing psi into the lab and subjecting it to (totally illusory) tight controls, when in fact we have no clue how strong or pervasive experimenter or onlooker psi may be, and even though we have no clue what role psi plays in life–hence, even though we have no clue whether lab conditions place the subjects in performance straitjackets and are wholly or largely inappropriate for getting a handle on the phenomena. Next, but connected with that, an indefensible (and often cowardly) reluctance to deal honestly and carefully with the evidence for large-scale phenomena, or spontaneous phenomena generally. As far as that matter is concerned, many parapsychologists remain as smugly ignorant as the worst skeptics of the field as a whole. I explore this rant in much greater detail in many of my writings–e.g., Limits of Influence and several chapters in Crimes of Reason. I’ve recently returned from Buenos Aires, where I was studying a promising PK subject who can partially levitate tables under good conditions including bright light. Those interested can find a paper about this subject, by Juan Gimeno, in the Journal of Scientific Exploration, vol. 29 no. 4. I plan to collaborate on another paper with Juan and his colleague there, Darío Burgo, bringing their research up to date and describing also the results obtained during my visit to Argentina. Shortly before that trip, I returned to Germany for more sessions with physical medium Kai Mügge. We got some genuinely interesting results, but it was not the success my colleagues and I had hoped for. I describe our sessions in JSE vol. 30 no. 1. For reasons noted in my paper, it’s unlikely that I’ll work with Kai again. But I remain naively optimistic that we’ll be able to work something out. Apart from that, my primary scholarly activity is continuing my on-the-job training as Editor-in-Chief of the JSE. 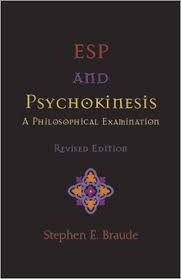 ESP and Psychokinesis: A Philosophical Examination. Philadelphia: Temple Uni­versity Press, 1979 (Revised ed. 2002). The Limits of Influence: Psychokinesis and the Philosophy of Science. New York & London: Routledge & Kegan Paul, 1986 (2nd ed., 1991, Revides ed. 1997). First-Person Plural: Multiple Personality and the Philosophy of Mind. New York & London: Routledge, 1991 (Revised ed. 1995). Immortal Remains: The Evidence for Life After Death. Lanham, MD: Rowman & Littlefield, 2003. 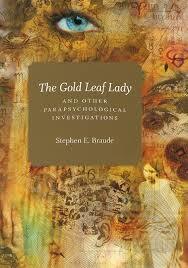 The Gold-Leaf Lady and Other Parapsychological Investigations. Chicago: University of Chicago Press, 2007. 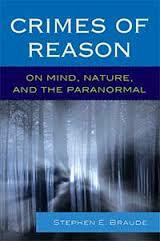 Crimes of Reason: On Mind, Nature & the Paranormal. Lanham, MD: Rowman & Littlefield, 2014. Toward a Theory of Recurrence. Noûs 5 (1971): 191-197. Tensed Sentences and Free Repeatability. Philosophical Review 82 (1973): 188-214. Are Verbs Tensed or Tenseless? Philosophical Studies 25 (1974): 373-390. Tenses, Analyticity, and Time’s Eternity. Philosophia 6 (1976): 39-48. Tenses and Meaning Change. Analysis 37 (1976): 41-44. On the Meaning of ‘Paranormal’. In Jan K. Ludwig (ed.) Philosophy and Parapsy­chology. New York: Prometheus Press, 1978: 227-44. Telepathy. Noûs 12 (1978): 267-30l. Objections to an Information-Theoretic Approach to Synchronicity. Journal of the American Society for Psychical Research 73 (1979): 179-193. The Observational Theories in Parapsychology: A Critique. Journal of the American Society for Psychical Research 73 (1979): 349-366. Taxonomy and Theory in Psychokinesis. In B. Shapin & L. Coly (eds. ), Concepts and Theories of Parapsychology. New York: Parapsychology Foundation, 1981: 37-54. The Holographic Analysis of Near-Death Experiences: The Perpetuation of Some Deep Mistakes. Essence: Issues in the Study of Aging, Dying and Death 5 (1981): 53-63. Precognitive Attrition and Theoretical Parsimony. Journal of the American Society for Psychical Research 76 (1982): 143-155. Radical Provincialism in the Life Sciences: A Review of Rupert Sheldrake’s A New Science of Life. Journal of the American Society for Psychical Research 77 (1983): 63-78. You Can Say That Again. Philosophic Exchange 17 (1986): 59-78. Psi and Our Picture of the World. Inquiry 30 (1987): 277-294. When Science is Non-Scientific. Journal of Near Death Studies 6 (1987): 113-118. Death by Observation: A Reply to Millar. Journal of the American Society for Psychical Research 82 (1988): 273-280. Some Recent Books on Multiple Personality and Dissociation. Journal of the American Society for Psychical Research 82 (1988): 339-352. Mediumship and Multiple Personality. Journal of the Society for Psychical Re­search 55 (1988): 177-195. Evaluating the Super-Psi Hypothesis. In G.K. Zollschan, J.F. Schumaker, and G.F. Walsh (eds), Exploring the Paranormal: Perspectives on Belief and Ex­perience. Dorset: Prism, 1989: 25-38. Multiple Personality and the Structure of the Self. In D. Kolak and R. Martin (eds), Self and Identity: Contemporary Philosophical Issues. New York & Toronto: MacMillan, 1991: 134-144. Survival or Super-Psi? Journal of Scientific Exploration 6 (1992): 127-144. Reprinted in Darshana International 32 (1992): 8-28. Getting Clear About Wholeness. In K.R. Rao (ed.) Cultivating Consciousness. New York: Praeger, 1993: 25-37. Psi and the Nature of Abilities. Journal of Parapsychology 56 (1992): 205-228. Also in J. Morris (ed.) Research in Parapsychology, 1991. Metuchen, N.J. & London: Scarecrow Press, 1994: 193-220. The Fear of Psi Revisited, or It’s the Thought that Counts. ASPR Newsletter 28, No. 1 (1993): 8-11. Does Awareness Require a Location? : A Response to Woodhouse. New Ideas in Psychology 12 (1994): 17-21. Dissociation and Survival: A Reappraisal of the Evidence. In L. Coly & J.D.S. McMahon (eds. ), Parapsychology and Thanatology. New York: Parapsychology Foundation (1995): 208-228. ESP Phenomena, Philosophical Implications Of. In D.M. Borchert (ed. ), Encyclopedia of Philosophy, Supplement. New York: Macmillan (1996): 146-147. Commentary on The Social Relocation of Personal Identity. Philosophy, Psychiatry, & Psychology 2 (1995): 205-8. Multiple Personality and Moral Responsibility. Philosophy, Psychiatry, & Psychology 3 (1996): 37-54. Postmortem Survival: The State of the Debate. In M. Stoeber and H. Meynell (eds), Critical Reflections on the Paranormal. Albany: SUNY Press (1996): 177-196. Commentary on A Discursive Account of Multiple Personality Disorder. Philosophy, Psychiatry, & Psychology 4 (1997): 223-226. Some Thoughts on Parapsychology and Religion. In C. Tart (ed), Body, Mind, Spirit. Charlottes­ville, VA: Hampton Roads (1997): 118-127. Peirce on the Paranormal. Transactions of the Charles S. Peirce Society 34 (1998): 199-220. Terminological Reform in Parapsychology: A Giant Step Backwards. Journal of Scientific Exploration 12 (1998): 141-150. Commentary on False Memory Syndrome and the Authority of Personal Memory-Claims. Philosophy, Psychiatry, & Psychology 5 (1998): 299-304. Paranormal Phenomena. In E. Craig (ed), Encyclopedia of Philosophy. London & New York: Routledge (1998). Dissociation and Latent Abilities: The Strange Case of Patience Worth. Journal of Trauma and Dissociation 1(2) (2000): 13-48. Out-of-Body-Experiences and Survival of Death. International Journal of Parapsychology 12 (2001): 83-129. The Problem of Super Psi. In F. Steinkamp (ed), Parapsychology, Philosophy, and the Mind: Essays Honoring John Beloff.. Jefferson, NC & London: McFarland (2002): 91-111. Reprinted and translated in A. Parra (ed), Mente Sin Fronteras, Buenos Aires: Editorial Antigua (2014): 275-299. The Creativity of Dissociation. Journal of Trauma and Dissociation 3 (3) (2002): 5-26. Counting Persons and Living with Alters: Comments on Matthews. Philosophy, Psychiatry, & Psychology 10 (2003): 153-156. The Nature and Significance of Dissociation. In J. Radden (ed. ), The Philosophy of Psychiatry: A Companion. Oxford: Oxford University Press (2004): 106-117. Reprinted in Pedagogic Reality (Yugoslavia) 48, nos. 7-8 (2002): 626-638. Les Psychographies de Ted Serios. In C. Chéroux and A. Fischer (eds), Le Troisième Oeil: La photographie et l’occulte. Gallimard (2004): 155-157. Reprinted as The Thoughtography of Ted Serios. In C. Chéroux and A. Fischer (eds), The Perfect Medium: Photography and the Occult. New Haven: Yale University Press (2005): 155-157. Personal Identity and Postmortem Survival. Social Philosophy and Policy 22, No. 2 (2005): 226-249. Reprinted in E.F. Paul, F.D. Miller, & J. Paul (eds) Personal Identity. Cambridge: Cambridge University Press (2005): 226-249. The Misuse of Memory in Psi Research. Aquém e Além do Cérebro (Behind and Beyond the Brain): Proceedings of the 6th BIAL Foundation Symposium. Porto, Portugal: BIAL Foundation (2006): 199-219. Memory Without a Trace. European Journal of Parapsychology 21, Special Issue (2006):182-202. Reprinted in AntiMatters 1, no. 1 (2007): 91-106. The Fear of Psi: It’s the Thought that Counts.” In Taylor, G. (Ed. ), Darklore Volume 2, Daily Grail Publishing, Brisbane (2008): 99-111. The Conceptual Unity of Dissociation: A Philosophical Argument. In P.F. Dell & J.A.ONeil (eds) Dissociation and the Dissociative Disorders: DSM-V and Beyond. New York: Routledge (2009): 27-36. Dissociative Identity Disorder. In T. Bayne, A. Cleeremans & P. Wilken (eds) The Oxford Companion to Consciousness. Oxford: Oxford University Press (2009): 234-235. Perspectival Awareness and Postmortem Survival. Journal of Scientific Exploration 23 (2009): 195-210. Toward a Theory of PK. AntiMatters vol. 3(3) (2009): 171-197. Psi and the Philosophy of Mind. AntiMatters vol. 3(4) (2009): 147-172. Parapsychology’s Future: A Curmudgeonly Perspective. Journal of Parapsychology 76 (supplement) (2012): 15-17. My Career on the Margins. In R. Pilkington (Ed. ), Men and Women of Parapsychology: Personal Reflections: Espirit, Volume 2. San Antonio & New York: Anomalist Books (2013): 89-102. The Possibility of Mediumship: Philosophical Considerations. In A.J. Rock (Ed. ), The Survival Hypothesis:Essays on Mediumship (Jefferson, NC: McFarland, 2014): 21-39. Macro-Psychokinesis. In E. Cardeña, J. Palmer & D. Marcusson-Clavertz (eds), Parapsychology: A Handbook for the 21st Century (Jefferson, NC: McFarland, 2015): 258-265. Follow-Up Investigation of the Felix Circle. Journal of Scientific Exploration, 30 (1) (2016): 29-57.